The reward you get for working at a nonprofit is the difference you make in somebody's life, says John Howell, president and chief executive of Easter Seals Hawaii, above. Also, he said, after 13 years at the job, he's still amazed at the quality and character of the people who work for such organizations. Question: How is the current capital campaign going for the new facility? Answer: We acquired the land in December 2004. We have raised probably two-thirds of the money we need. We've got almost all of the money identified, but the money that's either in the bank or pledged is two-thirds of the campaign amount. By early summer we should be completed with the fundraising portion. 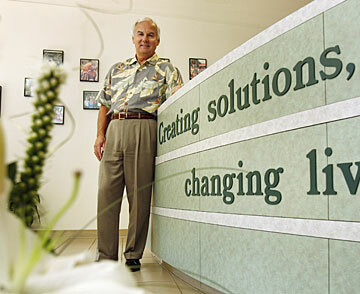 » Job: President and CEO of Easter Seals Hawaii since 1993. It was his first nonprofit job after a career in the private sector, working as a sales manager at Xerox Corp., Wang Laboratories' Asia area manager, and sales director for the former GTE Hawaiian Tel. » News: The nonprofit is nearing the end of a $6 million capital camp-aign and has bought 3.3 acres on Makakilo Drive for $520,000 to build a 20,000-square-foot facility. Its next "Taste of Honolulu" will be held the end of June. » Born and raised: Franklin, Va.
Q: Is it harder to raise funds since your last campaign 10 years ago? How much did you raise then? A: The previous campaign we did in '95-'96 turned out to be $3.5 million. I would say that this time it was easier. When Billie Gabriel and I first joined the organization, it had gone through challenges and struggles. We had to do some rebuilding. That capital campaign allowed us to move from rental facilities to facilities that we owned and got better leases on. It allowed us to better our programs. It allowed us to save a tremendous amount of money and rental expense and that money was reinvested in our employees and programs and services. Q: How have you changed your fundraising approach? A: It's like anything else, having the experience of having done something before. We were just a lot more knowledgeable about the process. The most significant thing is, fortunately, we were able to go into the state Legislature and get a grant-in-aid. We did not do that the first time. That was a million-dollar gift. We learned about the legislative process. We got great support. Easter Seals has enjoyed a positive relationship with the public and that made it a lot easier. They knew the money was going to be invested wisely because we had already done it before. Q: What problems did you face 10 years ago? A: I think the problems we had were not untypical of other nonprofits. In the mid-'90s, the state of Hawaii was going through a terrible recession. A lot of our programs were not receiving adequate funding for the state contracts we had. What we did is, we looked at the programs we were doing in 1993, and of the eight programs we had, four of them were not of quality. Either the funding was not good or the services were not up to the standards. We cut those programs and reduced our employees. From that we started to grow, but we had to go through some pain that first year. It wasn't pleasant but it was very necessary. From 1994 we were down to four programs and 35 employees. Eleven years later, we have 360 employees and 22 programs on four islands. Q: Do you ever plan to go back to the for-profit sector? A: No, and there's a reason why. I get asked that often. A lot of close friends of mine can't believe I'm still here. I've always believed in businesses that involved people. It was always a very people-oriented practice. When I came to nonprofits, I was amazed how motivated their workers are, how much heart they put into their jobs, and yet they were undercompensated. It was almost like they couldn't give enough to the job. In this nonprofit environment, people gravitate here because they want to be here. Thirteen years later, I'm still amazed at the quality and the character of people who work in a nonprofit. If I could bottle this stuff and take it to Bishop Street, I could be a millionaire, but it doesn't work that way. The reward you get is the difference you make in somebody's life. The other thing I enjoy about it ... I've been here 13 years, but I'm still a businessman. I enjoy the action. We are a very diversified organization. On any given day I'm working on insurance issues, revenue-sponsorship issues for the "Taste of Honolulu." I have the diversity of working in a very dynamic business. "Taste" in itself is a very small business. It's a million-dollar business. Q: I understand the 2005 "Taste of Honolulu" broke records. How many people were there? A: A little over 52,000 people over three days, and the net was around $280,000, after all expenses. Q: How much do you bring in from your letter-writing efforts? A: Last year was a little over $200,000. The significant thing about it, it comes in $25, $50 and $100 contributions.